Hearts suffered the first defeat of their pre-season schedule last night, going down 2-0 to Stevie Aitken’s Dumbarton at the Cheaper Insurance Direct Stadium. Headers either side of half-time from Grant Gallagher and Kevin Cawley respectively gave the impressive Championship outfit a deserved victory. In truth, Hearts were fortunate only to concede the two goals in what would nonetheless have proved a worthwhile workout for Robbie Neilson’s men in terms of fitness. Aside from Jack Hamilton, Liam Smith and Robbie Buchanan, Neilson started with the same side that finished the game at Stark’s Park on Tuesday night, ensuring the majority of his squad will have played 90 minutes over the two games. Buchanan started in an unfamiliar right-back role while Liam Henderson was back in the starting line up after suffering a slight knock in Monday’s under-20s’ match with Stenhousemuir. Alim Ozturk sat out again as a precaution against aggravating a minor thigh complaint, with his manager also taking into account the physical effects of the defender observing Ramadan. Leon Jones and Russell McLean were handed their first senior starts for the club. Dumbarton looked sharper than their Premiership opponents from the kick-off, looking to test an inexperienced Hearts back line, and were inches from taking the lead early on. Hearts failed to clear effectively and ball fell to Willie Gibson on the edge of the area. His low snap shot looked destined for the bottom corner before Hamilton showed his agility to tip it round the right-hand post for a corner. The Sons didn’t have to wait much longer for the breakthrough however, and were ahead on eight minutes. 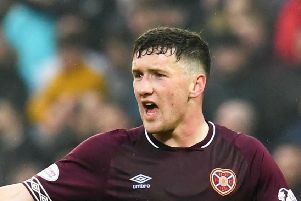 Gibson turned provider this time, his corner from the left met by Gallagher, who towered above the Hearts defence to power his header past Hamilton. The keeper then did well to prevent Garry Fleming doubling his side’s lead, getting a head to the striker’s looping header and gathering at the second attempt. The Jambos’ first shot in anger came on 13 minutes, but Billy King’s driven free-kick sailed over Mark Brown’s crossbar after Miguel Pallardo had been impeded. Indeed, it took a deflection off referee Muir from Smith’s cross to give Mark Brown in the Dumbarton goal something to do with more than 20 minutes played. Bizarrely, Muir was again closer than the action than intended at the other end on the half hour, diverting the ball into Fleming’s path, whose low shot across goal was parried by Hamilton. Gavin Reilly could barely have come any closer to opening his Hearts account from the resulting counter attack, latching on to King’s ball in behind, only for his angled strike to come back off Brown’s far post. The hosts then should have doubled their lead with a sweeping counter attack of their own. Kevin Cawley picked out Kirkpatrick on the left before motoring down the opposite flank to meet his team-mate’s back post cross, somehow sliding the ball wide from six yards. Hearts created their best opportunity of the half three minutes before the break. Smith surged forward from left back before feeding Reilly in the area. His attempt was parried by Brown to the feet of McLean, but the young striker leaned back and fired over when he looked certain to notch his first senior goal. The beanpole striker managed to hit the target shortly after the restart, but Brown stood up well to his header following King’s corner from the left. Strike partner Reilly was next to force Brown into a save after McLean slipped him in, the former Hibs keeper stopping with his feet. Despite that pressure, Dumbarton made it 2-0 on 55 minutes. Gibson’s corner was met by Buchanan, who’s header back across goal was nodded in by Cawley from close range. Neilson made the expected nine changes after an hour, with only Hamilton and Henderson remaining on the pitch in a more experienced team. Sam Nicholson almost added to the two goals he scored last time Hearts visited the Rock, but Brown was down quickly to stop his low drive. A hopeful Sean McKirdy strike aside, that proved to be the last meaningful action of a fairly sedate second half. Dumbarton: Brown, Taggart (Trialist 60), Docherty (Waters 60), Barr, G Buchanan, Routeledge, Cawley, Gallagher (Miller 60), Fleming (G Smith 45), Kirkpatrick, (Trialist 60) Gibson (McCallum 76). Hearts pre-60 mins: Hamilton, R Buchanan, L Smith, Jones, Howlett-Mundle, Pallardo, King, Henderson, Reilly, McLean. Hearts post-60 mins: Hamilton, Paterson, McGhee, Augustyn, Henderson, McKirdy, Anderson, Nicholson, Oliver, El Hassnaoui, Juanma.